Few people today would confuse Berkeley with Grover’s Corners, but for several years during the childhood of Thornton Wilder, Berkeley was “Our Town” to the Pulitzer Prize-winning novelist and playwright. He was the son of Amos Parker Wilder, a newspaper editor who in 1906 was appointed as American Consul General in Hong Kong. While the Wilder family at first accompanied the diplomat to China, they stayed only six months, and then Isabella Wilder returned to the United States with her children. In 1911, when the Mr. Wilder was transferred to Shanghai, the family briefly rejoined him, but eventually returned to settle in Berkeley. 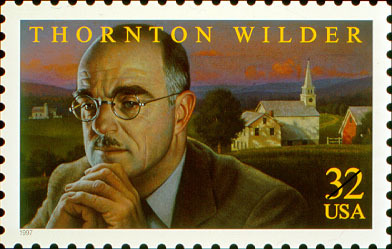 Thornton Wilder attended Emerson Grammar School (in the Elmwood District), and began high school at the exclusive Thacher School in Ojai. He found boarding school to be a lonely and isolating place. He cared little for the rough-and-tumble of sports-crazy adolescents, and his classmates teased him for being “artistic” and overly-intellectual; he was known as a “freak.” A former classmate recalled: “We left him alone, just left him alone. And he would retire to the library, his hideaway, learning to distance himself from humiliation and indifference.” In 1913 he transferred to Berkeley High for his junior and senior years, so that he could live at home with his mother and sisters. Unlike her husband, Isabella Wilder was artistic and worldly, and she made certain that she and her children took full advantage of the benefits of living in a university town. “In Berkeley,” writes Malcolm Goldstein, “she found opportunities to study informally by attending lectures at the University of California and by participating in foreign-language discussion groups. She was fully aware that her husband, were he present, would not approve, but she encouraged her children, nevertheless, in their independent, extracurricular search for knowledge.” Isabella saw to it that the children were given walk-on parts in plays presented in the Greek Theatre, and even sewed their costumes for them. Wilder left Berkeley to attend Oberlin College, and then transferred to Yale. He earned a Masters Degree in French from Princeton University in 1926. His first novel, The Cabala was published the same year, and in 1927 his second novel, The Bridge of San Luis Rey was awarded the Pulitzer Prize. In 1938 he won another Pulitzer, this time for his play Our Town and again in 1942, for his play The Skin of Our Teeth. Wilder and Steward were lovers for a brief period, but it was not a happy nor easy relationship. “If one accepts the essentials of Steward’s story....,” writes Gilbert A. Harrison, “the sexual act was so hurried and reticent, so barren of embrace, tenderness or passion that it might never have happened. Steward felt that for Thornton the act was literally ‘unspeakable’.” If Wilder ever experienced a deep and lasting relationship with another man, it has not been recorded. Thornton Wilder’s play Our Town has become a staple of high school drama departments, attractive perhaps more for its economical lack of scenery and props than for its sad story of love, loss and regret. There has been speculation that the character of Simon Stimson, the town drunk and organist for the Congregational Church who eventually commits suicide, represents a closeted gay man destroyed by life in a small town. Starved of the environment of love: hence forever after exhibiting so greedy and omnivorous an expectation of love that no affection they receive is adequate, and (what is worse) their affection for others is not truly love but a demand and command to be loved. I am more and more willing to agree with certain authorities that homosexuality is negative — that it is, even when apparently aggressive, a submission to solicitations. These solicitations are not necessarily those coming from the outside; they come from within also, from an exorbitant need for tenderness, i.e., to be valued by another. Samuel Steward, Dear Sammy: Letters from Gertrude Stein and Alice B. Toklas (Boston : Houghton Mifflin, 1977). Copyright 2002 Regents of the University of California. Email: benemann@law.berkeley.edu.